Editor's note: This week's cover story featured excerpts from opinion pieces written by local high school students on the topic of school shootings and gun violence. Here are all the submissions we received from them, posted in their entirety and only lightly edited for style and grammar. Read them and join the conversation in the comments below. The protests happening across the country have both devastating and remarkable connotations. Devastating in both the events that have provoked these demonstrations and the lack of action from the government despite these continual student-led movements, which are explicitly asking for a legislative response. But they're are also simultaneously remarkable in the sheer magnitude and perseverance in not only the Parkland survivors but the rest of the nation's high school and college students. The amount of effort and thought that these student activists from Marjory Stoneman Douglas High School, where the shooting last month occurred in which 17 students and staff were killed, are putting into their campaigns and speeches to the country is incredibly inspiring. Their recently launched campaign named "What if?" 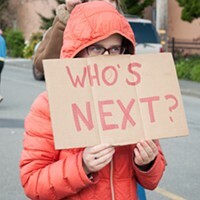 is composed of questions to invite both the public and politicians to reconsider their views opposing gun control. Some statements include "What if the children of America become more powerful than our politicians?" or "What if politicians actually listened to the concerns of my generation?" 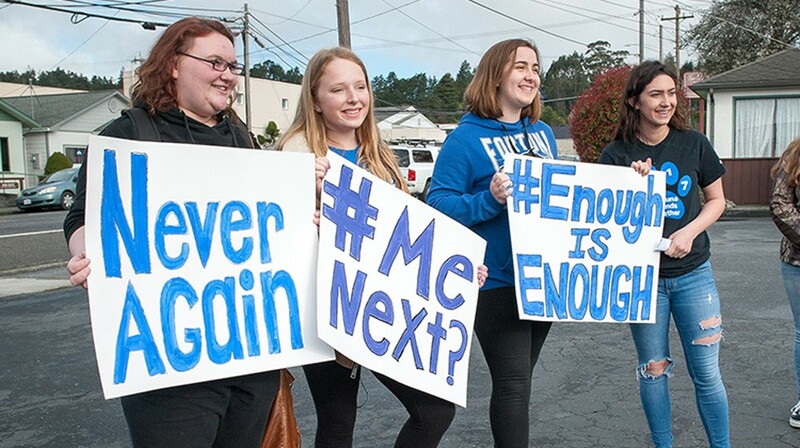 Here in Humboldt County, youth have also participated in student-led walkouts and demonstrations. At my high school, Northcoast Preparatory Academy, or NPA, myself and almost 90 percent of our entire student body walked out of our classes on March 14. During the national 17 minutes of respect for the Parkland victims, our school decided that we would call as many of our elected representatives as we could. I was a part of the Walkout Committee, a student group that organized the logistical aspects of the walkout. We prepared a script for those of us who walked out, which offered numbers of representatives to call and a few brief sentences about where we were from, why we had walked out of school and what changes we wanted made. I was the designated reporter for our school's newspaper, so I had the chance to interview students and listen to their phone calls. Hearing the confidence of each of my classmates, even freshman, leaving messages at the White House and with representatives such as Jared Huffman, repeatedly brought me nearly to tears. This issue and this debate are quite different from the topics of the previous national discussions that have become popular, such as abortion, police brutality, drugs, etc. This is something that every single student can say they are affected by. With the others topics, sure, you can pretend to ignore them or wait until they go away. The threat of school shootings and the discussion of arming teachers, however, can affect anyone, so people are somewhat required to have an opinion about it. Because these events have been so prominent, not only with the public, but especially with high school students, it has shown the immense capability of America's youth. While there has not yet been direct federal legislation passed in acknowledgment of the students' voices, the response from the rest of the country has been deafening. This is because those who support this topic have felt comfortable enough to vocalize their support, just like the students at my high school did during our walkout. These movements have given people, especially young people, the assurance that they can be heard — if not by Congress, then by the rest of the nation. The reality of school shootings is so overwhelming that I don't think we really ever can grasp it. To those of us who have never been in a situation that even warranted a lockdown on our school campus, the thought of a shooting is something that feels so unrealistic that we often fail to address the possibility of it. So many of us watched the Feb. 14 shooting at Marjory Stoneman Douglas High School in Parkland, Florida, unfold and heard the students speak in the aftermath. Hearing our peers speak about the pain and terror that struck their school on Valentine's Day brought a whole new level of reality to the situation. The reality is that we need to talk more. We need teachers to engage in conversations with us, to tell us what to do and when to do it. We need to know where to hide in every classroom and where to run to if we can. Support like this from our school administrators and teachers is absolutely vital to students feeling safe in class. The reality that school shootings are happening is something we all need to face. If we keep shying away from what has happened, because it has become a partisan issue, kids will keep getting hurt. We need to talk. As students, let's start by listening to our peers. This means telling those who have experienced this pain, we want to listen when you want to speak. Let's start supporting those around us who are hurting, isolated or scared. This means active support. Let's stop ignoring the kids who are quiet, those who don't always raise their hands in class. We need to make a community that is strong, we need to be able to trust each other. Let's start to engage in conversations, start to bring each other up and smile at one another in the halls. As students, we all want to be safe and we all want to feel like we are a part of something. Teachers, get to know your students. Ask them about their days and listen when they ask for help. Trusted adults are so important to students and we need to start building that trust. Parents, start addressing what has happened with your kids. Make a plan, talk about what they can do to protect themselves. If we find these ways to engage with one another and to hold each other up, we can grow a community that allows us to hold one another when we are in pain, and to help each and every student heal from our experiences. Together we can hold hands with those healing from trauma and those still hurting. When the government ignores those who rightfully demand gun regulations, the community that we can build needs to support these courageous kids who speak out. Courage and strength come from all of us — teachers, parents and students — coming together to tell each other we are here, together. As students, we must be the ones urging our government and leaders to make sure no one who may shoot people has access to guns. To those ready to share their stories, we want to listen. To teachers afraid to speak about a plan, please do; if we all know what to do, we can keep each other safer. Together, we can form a community that is much stronger than fear and hate. These are difficult conversations to have, but if we can talk to one another, we may no longer have to have them. We as a society want to know how to stop school shootings but first we must ask ourselves what develops a "school shooter?" People blame it on the lack of gun control or the "shooter" but I say it is much deeper than that. Society automatically wants to blame the person with the gun but in order for the person to detach from the world and disregard human life, they must have a history that leads them to a desensitized state of mind. Their history must have biological, psychological and/or environmental reasons for having mental health disorders. A "shooter" is not of a stable mind, thus they lack the ability to make good moral judgments. I would never expect my school to be a victim of such horror as a school shooting but, as long as society wants to blame the guns and the shooter, we will not find a solution that prevents our schools from becoming the next victims of an attack. Since school shootings have occurred more frequently, I now observe and survey my classrooms and ask myself which kid could be a threat to our school. I question how well I know my fellow classmates and wonder if the people I thought I knew could be someone I should potentially fear. It frightens me to think any student could cause so much anguish to so many innocent lives. Eureka High School has always been a safe place for me, as well as many of my fellow classmates. However, I witness situations at school and interact with students who do not feel the same safety within the school's walls as I do. I witness students being bullied by fellow students and, because of this, school is an unsafe environment. They have to attend school everyday and everyday they face the same abusive and aggressive behaviors from their attackers. Many of these same bullied students leave school and have to face more bullying and abuse in their homes from yet another attacker. "School shooters" aren't the healthy, happy students we see roaming our school halls. They are the students that withdraw and isolate themselves from the general population because they feel victimized. Wikipedia defines a bully as "a person who uses strength or power to harm or intimidate those who are weaker." Incidents of bullying can occur in a student's own household, from fellow classmates, in their social environments and, unfortunately, even from their institutional superiors. The effects of bullying and abuse at a young age damage their identity and mental health. In middle school, I was a victim of bullying. Not only did bullying affect my physical drive, it overwhelmed me mentally. If it wasn't for my supportive, guiding family and my loving, caring friends, I may not be as mentally stable as I am today. I was fortunate to become stronger from the incidents of bullying inflicted from my abuser. However, other teenagers they may not have the resources and ability to recover from such trauma. As the abuse destroys their self worth, they will seek to protect themselves and possibly get revenge. When we think of a "school shooter," we can't just blame the gun or the kid. We have to blame society, biology, psychology and environment to which the student has been exposed. In all reality, a "school shooter" is not only the attacker but the victim of a long standing attack. Until society starts accepting the root cause of "school shootings" we will continue to point fingers and argue about gun control. All the while, children continue to be victimized by bullying and, because nobody is protecting them, they are being groomed to become our next school shooter.